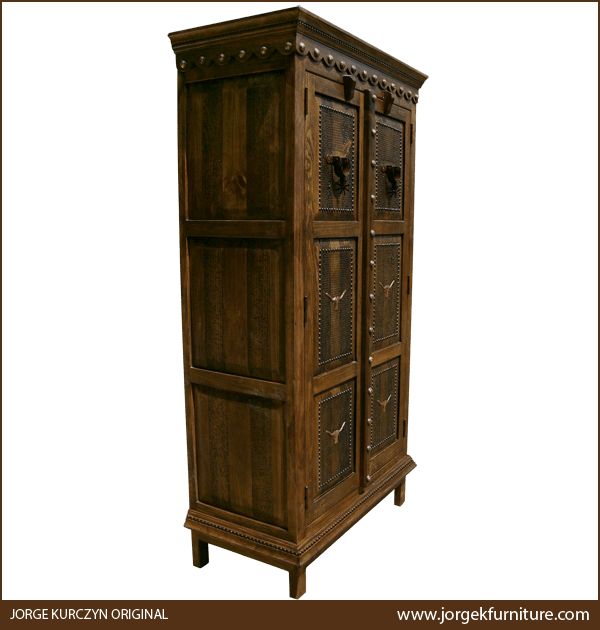 This handcrafted, Western style armoire features two, large, solid wood, rectangular doors, and each door has six, rectangular cut, vertical panels on its front. Centered in each of the top, two panels is a hand hammered and hand tooled, copper spur, and the front of the remaining four panels are embellished with a hand hammered and hand tooled bull head with horns. The border of each panels is highlighted with precision hand tacked gilt nails, and the doors are divided by intermittently hand tacked copper conchos. 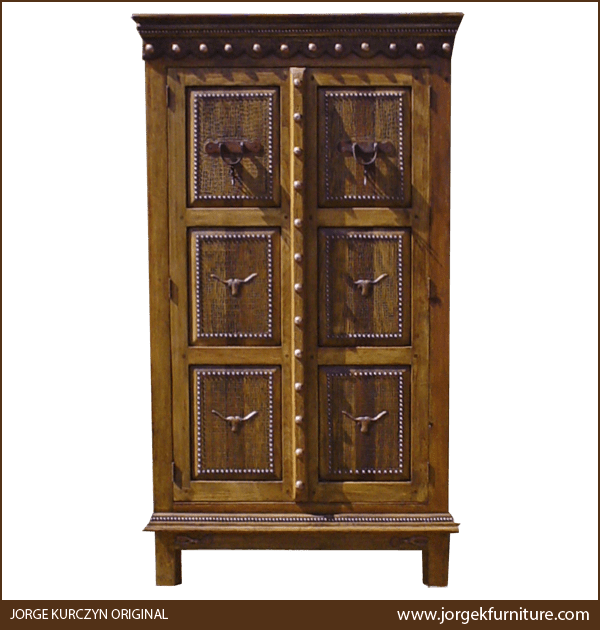 The armoire has a staggered, solid wood, top, crown molding, and this design is repeated on the base. The area below the top molding is embellished with beautiful, hand tooled, copper conchos, and the lower molding base is also enhanced with hand tacked gilt nails. Each lateral side of the armoire is adorned with decorative, rectangular cut panels. It has an antique finish, and it rest on square cut legs. The armoire has a large, inside open space for practical storage, and this space can be customized with shelving and drawers. It is made with the best, sustainable, solid wood available, and it is 100% customizable.